I chose going out in nature over going out for Halloween. With those words, my transition from college-out-all-night-drinking Nikki to old-cranky-get-off-my-lawn Nikki is nearly complete. To be fair, some of my friends still managed to make it out to U Street for Halloween. But my energy is fueled by the sun, and with daylight savings time coming to an end, there’s no way I could go out to Shenandoah and be fun at night. Choices had to be made, and I was antsy to get in touch with nature. My schedule has been a little crazy, and I was clocking almost two months since my last hike. Not only was that way too long, I was losing out on some of the best hiking conditions of the year. 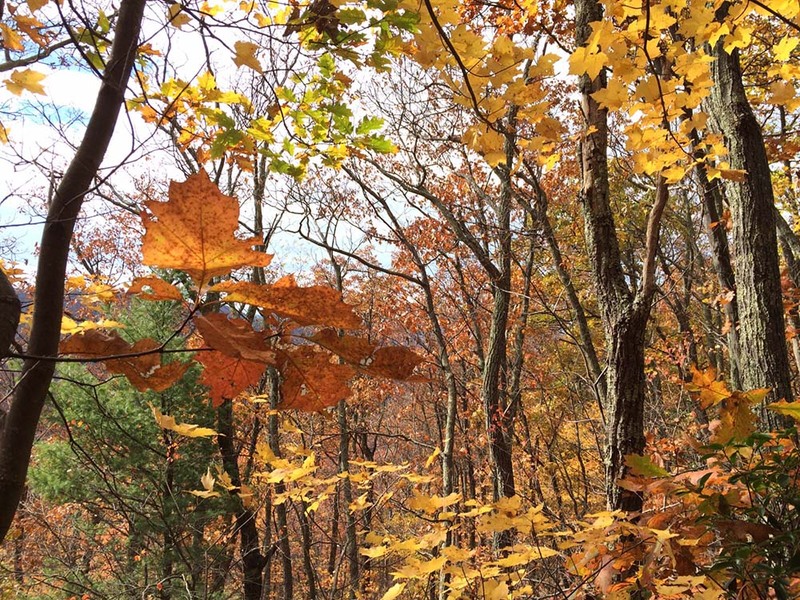 Luckily, there was still time to go out and view fall’s colors! 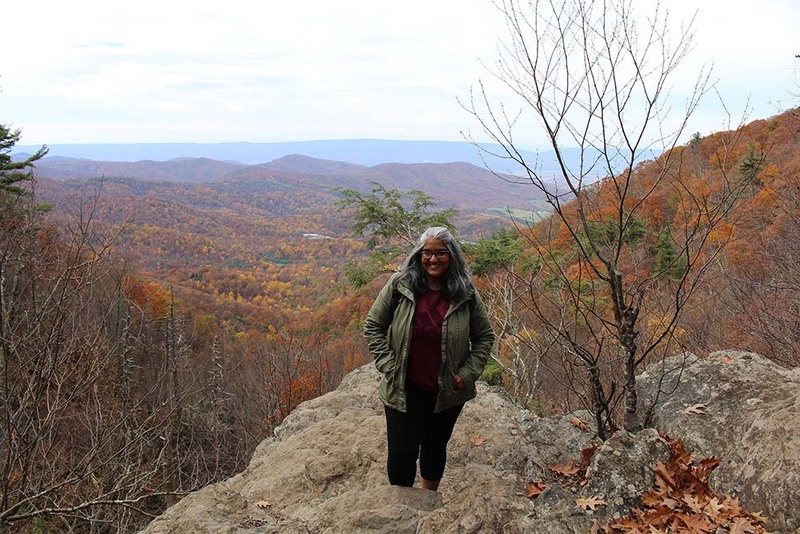 So with no time to waste, I made plans with my friends Sireen and Ashwini to head out to Shenandoah for a day of photographing nature and light hiking. Since the focus of this trip was photography, we wanted a relatively short trail that wouldn’t take a lot out of us. Given how many people visit Shenandoah each year, I figured it would be no problem picking out the perfect trail online. It’s easy to find information on the fun, challenging trails, but apparently people aren’t wasting internet space on the easier stuff. For the first time, I saw the value in investing in one of those trail guide books, because it’s clear that if I want to do less popular trails, Googling isn’t going to cut it. At the Lewis Falls trailhead. I finally settled on Lewis Falls Trail. It seemed like an easy round-trip route that none of us had done before and, as a bonus, would include a nice waterfall. Breaking from my normal routine, I didn’t print out a map and over plan things. This was a mistake, because, looking at the map now as a reference for writing this post, I realize that I accidentally made the trail harder than necessary. If we’d done the short route correctly, we would have started at Skyline Drive, parking near Tanners Ridge Overlook. The reason we got that wrong? Me. I’m taking full responsibility for this one. I remembered seeing the sign for the trailhead near the Amphitheater during a hike last summer, so we parked there and started the trail at that entrance – taking us down the longer part of the trail. Whoops! Ashwini posing for a leaf-filled pic by Lewis Falls. I forgot what it was like to hike in the fall. The crisp air, the stillness, the weird feeling of being cold and sweating at the same time. And leaves. The leaves were everywhere. I had to pretend to be a mature adult and restrain myself from stomping through them like a little kid. There was also danger. The leaf layer was thick and you couldn’t see anything through them. Just out of eye sight, loose rocks and roots were waiting to trip us and leave us flat on our faces. 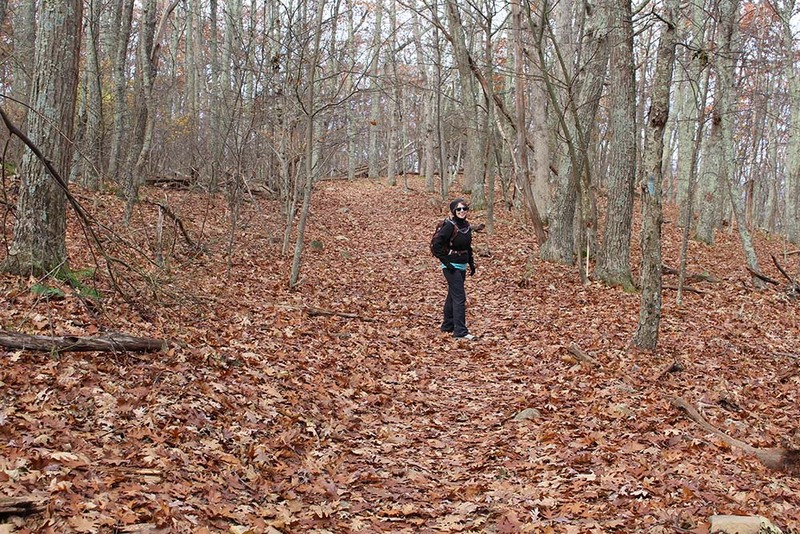 In a few parts of the trail, the leaves were wet, adding to the peril. I had visions of slipping and falling down the mountain. Not my idea of a good time. Despite the danger of falling, we ran into a group of three people trail running. Shout out to all the trail runners out there. The danger to our ankles was real, but they boldly laughed in the face of it and lapped us. It was a 1.2 mile downhill journey to Lewis Falls. Because it was late in the season, there weren’t that many people around (other than the badass trail runners). We had way more solitude on the trail than I’m used to, and it was very peaceful and chill once we got to the observation point. The view from the top of Lewis Falls. 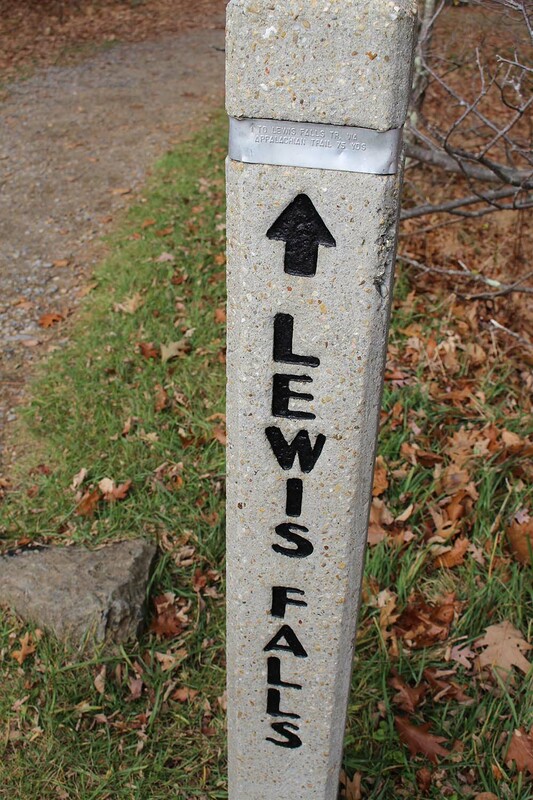 I found Lewis Falls a little disappointing. I guess I’ve gotten spoiled by the views at White Oak Canyon and Dark Hollows, and I kind of expected to see something similarly breathtaking. 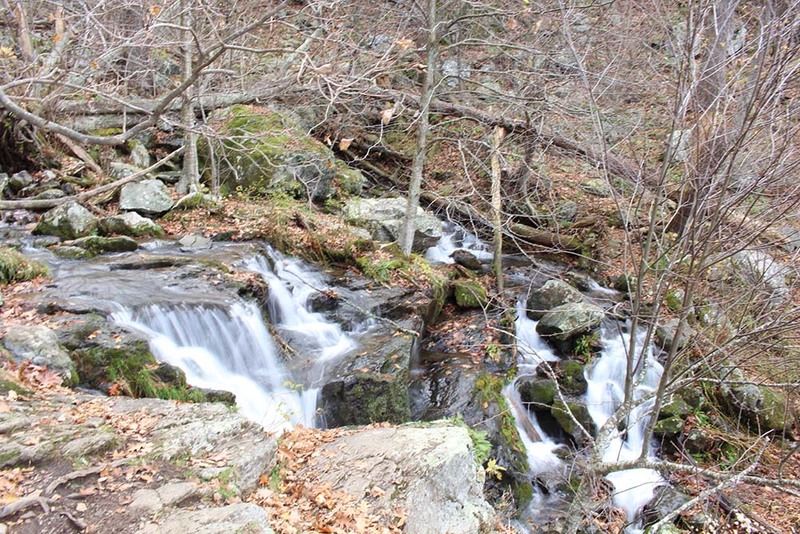 The 81-foot fall is pretty amazing, but there’s just no comparison to the other Falls in Shenandoah. Seriously, though, no complaints from me. Any day when you get to see a natural wonder is a pretty good one. We returned the way that we arrived, and the trip back was almost entirely uphill. It was a very steep incline, and I had to make two stops just to catch my breath. My personal preference is to tackle the uphill first when it’s earlier in the day and I still have all my energy. Doing the uphill part second got a little tedious. I did warm up from the exertion (it got a little cold around the waterfall while we were resting and eating), but it wasn’t my favorite. 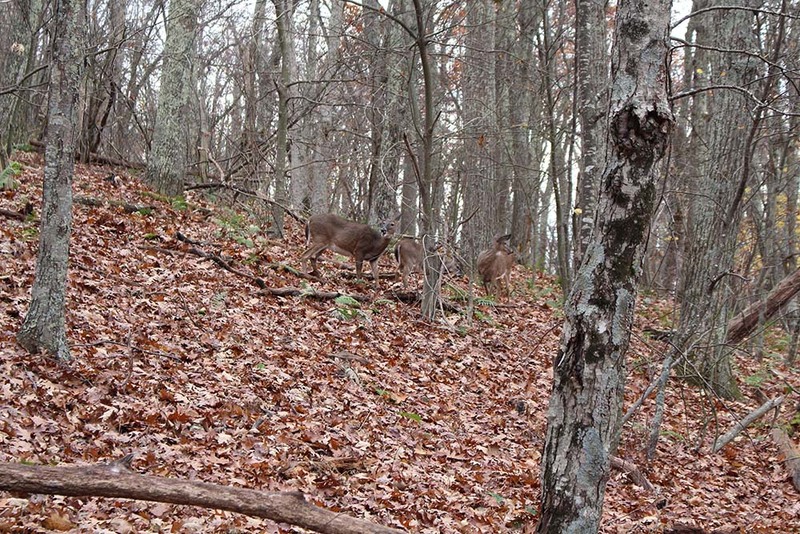 About a quarter of a mile from the parking area, we spotted three deer. I know I see deer all the time (just saw one crossing Rock Creek by the Zoo), but I love getting to see animals in their natural habitats. This sighting was definitely one of the highlights of the hike. It was an okay hike. Given how many amazing hikes we have access to in our region, I wouldn’t be in a rush to do it again. Bonus pic! Being ridiculous at one of the observation points on Skyline Drive. Do you have any trail guide book recommendations? Leave them for me in the comments section!